There is something magical about recipes like these which are so simple to make but the guests just cannot get enough of it. Its a simple 5 ingredient recipe. Its perfect for parties as they can be made ahead of time. Its also perfect to make as dessert for your family for those easy cozy friday night dinners. 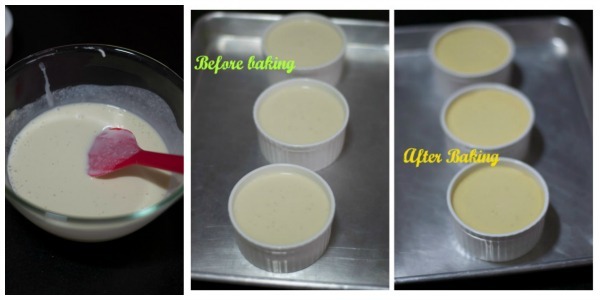 Here is how to make baked vanilla yogurt. Take a bowl and add in half a cup each of plain yogurt, heavy cream and condensed milk. I used home made fresh yogurt that’s not sour. Store bought yogurt works fine too. In India, we do not get heavy whipping cream. We get only low fat cream and it works fine for this recipe. I used Amul cream today. Now we need to add vanilla. We need real good quality vanilla extract for this recipe. Please do not use imitation vanilla. Once you have tasted good vanilla, you will never go back to anything else. 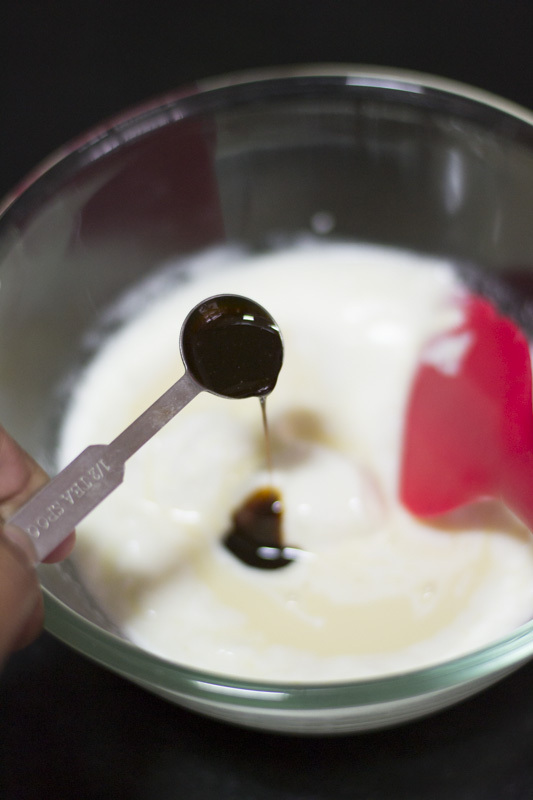 I use the brand of pure vanilla extract called Goodness Vanilla. It also makes me proud that it comes from my home town near Coimbatore from a place called Pollachi. Its one of the best vanilla you will find in India. Buy Goodness Vanilla Online. 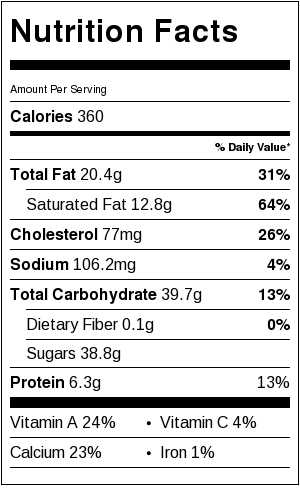 I cannot emphasize more on using good quality ingredients. Your end product will only be as good as the quality of the ingredients you use. Add in 1/2 a teaspoon of vanilla extract to the mixture. Mix everything well until smooth. 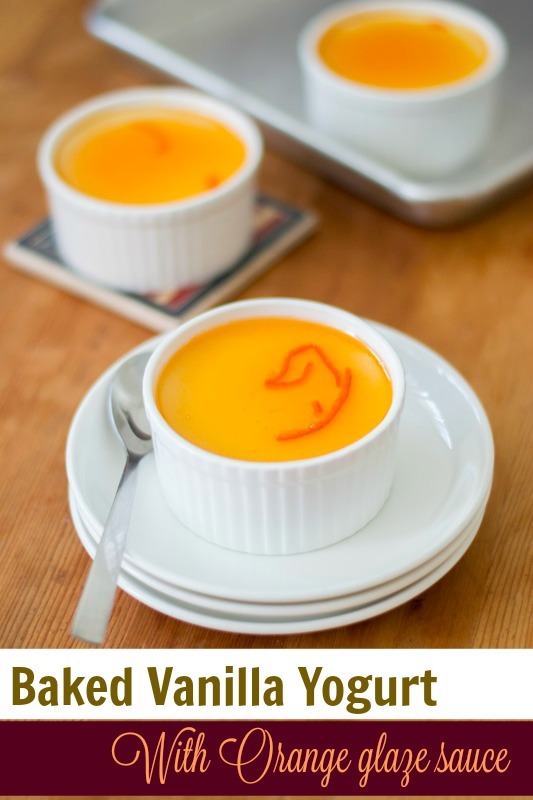 Pour it in ramekins and bake in a 120° celsius oven for 15-20 minutes. No need to preheat the oven for this recipe. After 15 minutes, the middle of the ramekins should be jiggly. If its still liquid, bake for a couple of minutes more. Do not let it cook for long else it will become hard. Remove from the oven and allow it to cool. In the mean time lets make the glaze for the yogurt. 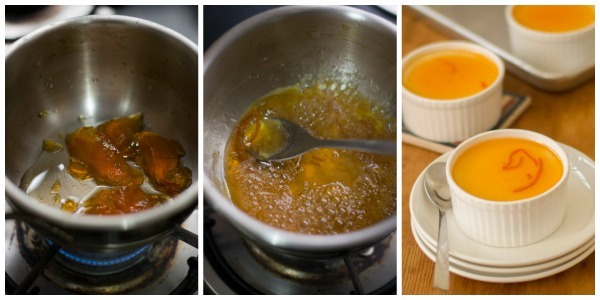 Take 2 tablespoon of orange marmalade or jam of your choice and add in 2 tablespoon of water. Bring it to a simmer until the jam has melted. Allow it to cool a bit and pour a tablespoon of the melted syrup on each ramekin. Refrigerate for 6-8 hours in the fridge and serve cold. One of the simple and best desserts ever! Easy 5 ingredient recipe for baked vanilla yogurt with orange glaze sauce. Beginners recipe. Take a bowl and add in half a cup each of plain yogurt, heavy cream and condensed milk. Mix everything well until smooth. Pour it in ramekins and bake in a 120° celsius oven for 15-20 minutes. No need to preheat the oven for this recipe. After 15 minutes, the middle of the ramekins should be jiggly. If its still liquid, bake for a couple of minutes more. Remove from the oven and allow it to cool. Take 2 tablespoon of orange marmalade or jam of your choice and add in 2 tablespoon of water. Bring it to a simmer until the jam has melted. 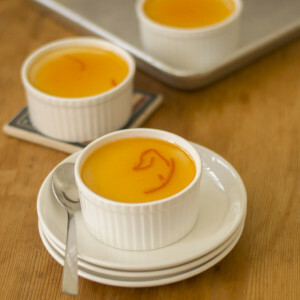 Allow it to cool a bit and pour a tablespoon of the melted syrup on each ramekin. Refrigerate for 6-8 hours in the fridge and serve cold. Next Post → Poondu Rasam Recipe / Why Rasam should never be boiled for a long time? I’m an ardent fan of kannamma cooks and I quite closely follow this blog! I watched this show a few days back. Somehow I felt both the recipes were from your site, second one tweaked a little with no mention of you. I’m into learning process of baking, easy explanation will be trying it soon, I just need to know usually for baking which oven goes well OTG Or convection mw. 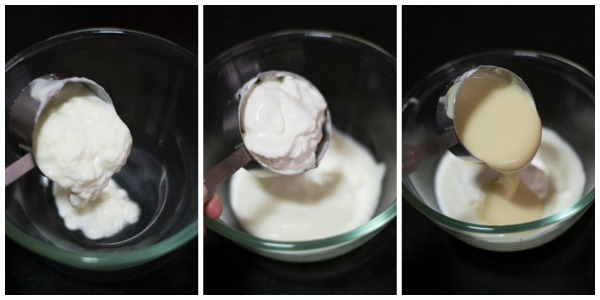 I tried this recipe and I have water inside my baked yogurt, did I do something wrong? Thanks for the recipe! ! I tried this recipe and it was a super hit at my place. The easiest dessert. I have a couple of suggestions for variations of this dessert – a. add fruits to this for a delicious fruit salad. b. Sprinkle brown sugar on top and torch it with a lighter to get a caramelized crust ala creme brulee. Thanks for this wonderful recipe, this is so different and easy to prepare! This is a favorite dessert not just for us, but our guests also! I have made this over 20 times – for get togethers, birth day parties and just when the mood strikes for eating a heavenly dessert 🙂 So easy to make but so wow inducing!